A sentinel lymph node biopsy is the removal and testing of specific lymph node tissue called sentinel nodes. The sentinel nodes are the lymph nodes to which cancer would spread first. This biopsy is done to determine if cancer cells have spread from the tumor to nearby lymph nodes. Cancer often spreads from the tumor to the nearest lymph node or nodes. These lymph nodes are called the sentinel nodes. It is important to understand that the sentinel node will probably be the first one to get cancer if the cancer has spread. For example, the sentinel nodes in breast cancer are often found in the armpit. This biopsy is often done during cancer-removal surgery or prior to surgery. Sentinel node biopsy is part of the staging process. Staging is an attempt to determine how much the cancer has spread away from the original tumor. The cancerous tissue may have been biopsied already. General anesthesia —You will be asleep during the procedure. Local anesthesia—The area will be numb. Regional anesthesia—An area of your body will be numb. A blue dye, and often a radioactive tracer, will be injected into an area near the tumor. It may be done several hours before surgery. The dye and tracer will travel from the tumor area to the sentinel nodes. This will also help identify which nodes are the sentinel lymph nodes. A small incision will be made. The sentinel node(s) will be removed. The removed node will be checked for cancer cells. If cancer is found, the rest of the lymph nodes in that area will be removed. If cancer is not seen in the sentinel node, it is unlikely that the cancer has spread to the other remaining lymph nodes. The other lymph nodes are not removed. The biopsy takes about 30-60 minutes. Surgery to remove the entire cancer takes longer. 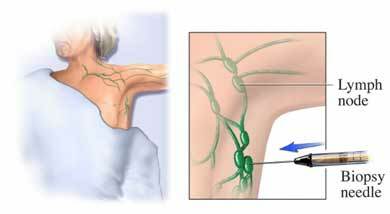 The result of the sentinel lymph node biopsy determines if additional lymph nodes need to be removed. It can also help determine the severity of your cancer. Dauway EL, Giuliano R, Haddad F, et al. Lymphatic mapping in breast cancer. Hematol Oncol Clin North Am. 1999;13(2):349-371. Leong SP. The role of sentinel lymph nodes in malignant melanoma. Surg Clin North Am. 2000;80(6):1741-1757. Sentinel lymph node biopsy: questions and answers. National Cancer Institute website. Available at: http://www.cancer.gov/about-cancer/diagnosis-staging/staging/sentinel-node-biopsy-fact-sheet. Accessed November 28, 2017. Veronesi U, Paganelli G, Viale G, et al. Sentinel-lymph-node biopsy as a staging procedure in breast cancer: update of a randomized controlled study. Lancet Oncol. 2006(12);7:983-990. 1/22/2010 DynaMed Plus Systematic Literature Surveillance http://www.dynamed.com : Torres Lacomba M, Yuste Sánchez MJ, Zapico Goñi A, et al. Effectiveness of early physiotherapy to prevent lymphoedema after surgery for breast cancer: randomised, single blinded, clinical trial. BMJ. 2010;340:b5396.